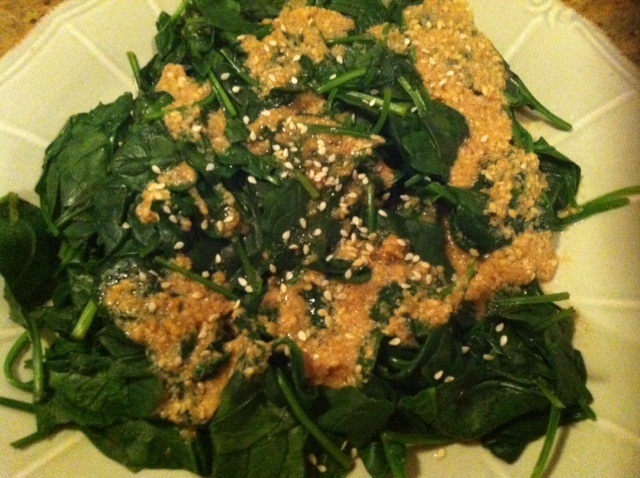 This week's Wednesday with Donna Hay recipe was chosen by Kayte from Modern Classic Book I - spinach with sesame dressing. I used baby spinach instead of spinach, halved the recipe and used Shao Xing Rice Wine rather than mirin (because that is what I had). My sauce ended up being rather chunky with the ground sesame seeds - hmmm, the photo in the book shows the sauce as being quite liquid. In any event, I liked it - not enough to make it again (I found the rice wine had a slightly peculiar flavour to my palate), but enough to eat it. Recently, I had a minor day procedure, and even though I only live two blocks away from the hospital, I was not permitted to walk home or leave alone. My friend Craig saved the day and picked me up so that I was allowed to leave. To say thank you, I made him a cake all for himself. As Craig is gluten and dairy intolerant, his cake had to be gluten free and dairy free. I was pretty excited, as this gave me a chance to use my scrumptious new book, Honeybuns Gluten Free Baking by Emma Goss-Custard. Honeybuns is a UK bakery that started in Oxford but is now based in Dorset. One flick through the delicious looking pages of the Honeybuns book, and I knew I had to have it in my library. The recipes in Honeybuns are not dairy free, but it doesn't take a genius to make them that way. For Craig, I chose the Toffee-Topped Almond and Rhubarb Cake (p21 Honeybuns). How could I not - it has rhubarb cooked two ways, oodles of caramel-like brown sugar and almonds. Yum! And the verdict? Delish! Unfortunately, I did not have any toffee on top of mine, but otherwise it was a replica of Craig's cake. Because the cake contains polenta and almond meal, it has both texture and crunch, and the polenta gives the crumb a lovely golden hue. The rhubarb adds moisture and flavour, and the brown sugar gives a glorious caramel flavour to the cake. There is also rhubarb on top of the cake in the recipe, but because I didn't want to make the cake soggy to give to Craig, who obviously wouldn't be eating it straight away, I left it off the top. However, there is plenty of rhubarb in the cake itself. Preheat your oven to 180 degrees Celsius and line a 23cm round cake tin with baking paper, spray with non-stick cooking spray and dust with rice flour. For the baked rhubarb, put the rhubarb onto an oiled or lined baking tray, sprinkle with brandy and bake for 20 minutes, stirring half way through. Remove the rhubarb from the oven and allow it to cool, but leave the oven on and reduce the temperature to 170 degrees Celsius (I didn't reduce it). To make the toffee rhubarb, melt the dairy free spread in a saucepan, and add the sugar, golden syrup and rhubarb. Stir until a toffee sauce forms, then simmer for around 5 minutes or until the rhubarb is soft but still maintains its shape. Take off the heat. Break the eggs into the bowl of a stand mixer and add all the dry ingredients, the extracts, the melted dairy free spread and the toffee rhubarb and baked rhubarb. Beat with the paddle attachment until well combined. Pour the batter into the prepared cake tin, and bake for approximately 40 minutes or until cooked through. Remove the cake from the oven and allow it to cool in the tin for an hour. 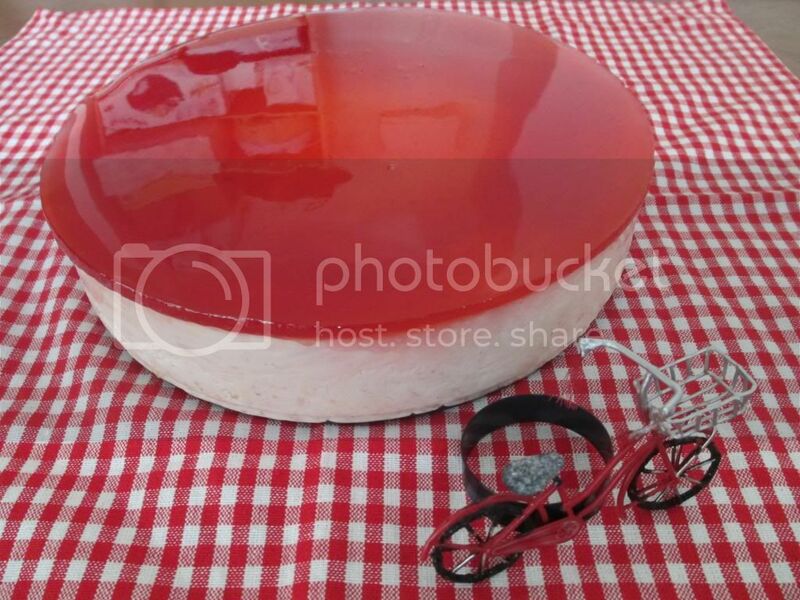 Unmould the cake onto a cake board or plate. Make the almond toffee topping by putting the almonds and sugar in a saucepan over low heat and stirring continuously until the sugar has dissolved and turned golden, and the almonds are coated with the liquid. 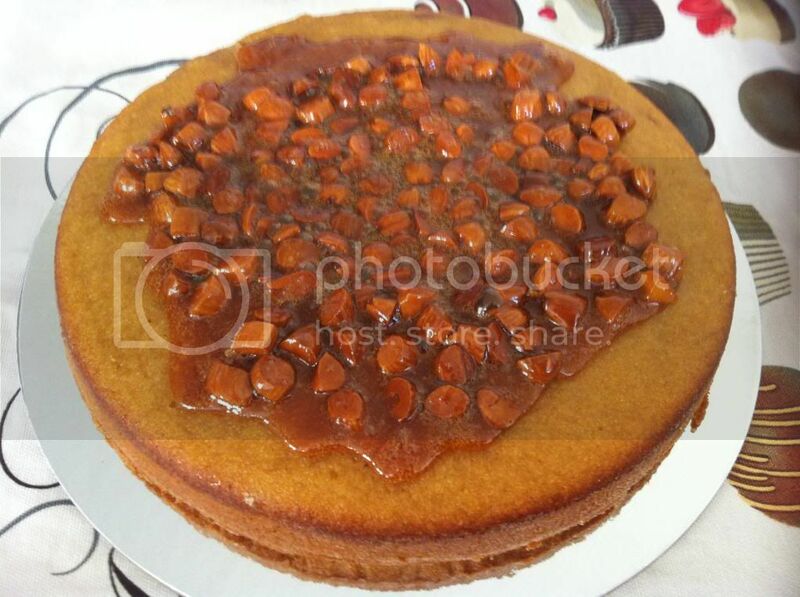 Pour the toffee over the top of the cake and allow to cool and set before serving. In Australia, we are in the middle of winter, and the last week seems to be telling us that winter has only just begun. As the Northern hemisphere is cold at Christmas time, Aussies like to celebrate a second "Christmas" in July so that we too can comfortably enjoy all of those wintery Christmas treats that are wholly inappropriate when the sun is blazing and it is thirty plus degrees outside. To celebrate Christmas in July, a group of ladies from my work went to lunch at Kamel in Albert Park. Kamel serves Middle Eastern and North African inspired mezze dishes - right up my alley. The vodka certainly packed a punch! The pistachio crumbed goats cheese was revelation - I loved it. I was not such a fan of cheesy prawns, but it was OK. I cannot begin to explain how devine this was, and it was a hit with everyone at my end of the table. I laughed when my friend Sandra happily dug into this salad, but fished out the cheese (as she doesn't like dairy). I just had to read those ingredients to fall in love. 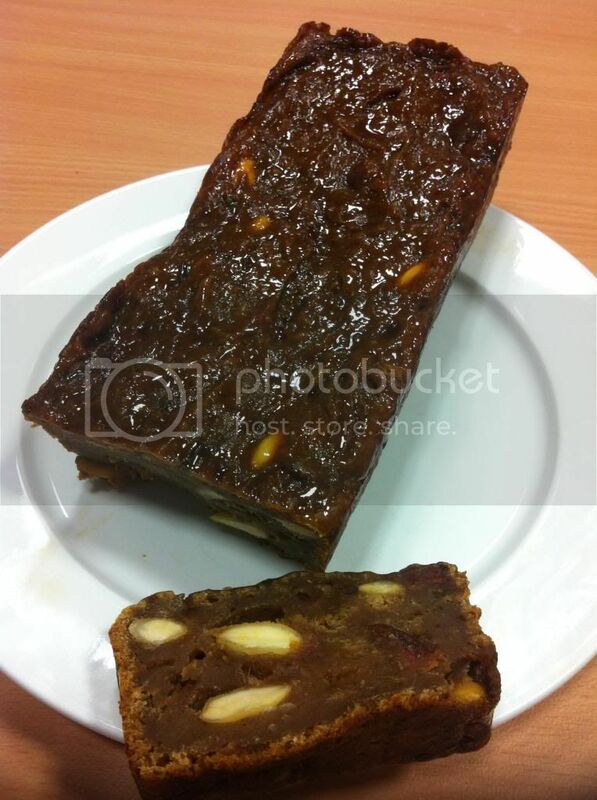 I like meat and fruit together, and to have dates, one of my favourite things ever, feature in the dish was a treat. I thought this was OK, but I liked the chicken better. People were incredulous that I did not want the crackling - but just the thought of crispy fat makes me shudder. As you can imagine, these potatoes were addictive - so addictive that we had to ask the staff to take them away so that our heaving bellies could fit in some dessert. And the dessert was worth the wait - a platter of turkish delight, baklava, turkish fairy floss, halva icecream and turkish delight icecream. I adore Turkish delight, and there was no competition for either the cube of rose flavoured or vanilla flavoured Turkish delight - so it was all for me! The Turkish delight icecream was a favourite of everyone at our end of the table, but the little baclavas were a tad dry. Everyone unanimously voted the food spectacular, and that it was a fabulous way to celebrate Christmas in July. When you are finished eating, if walking does not seem too impossible after all of that food, there are lovely little shops near Kamel. In a pet accessories store, Sandra and I met a gorgeous miniature schnauzer named Mimi who happily took all the attention we could give her. There is also a fine bookshop and some lovely homewares stores, not to mention an organic grocer. Accordingly, a visit to Kamel is a great opportunity for an all round outing. This month's Daring Bakers challenge is a choose your own adventure. For me, the choice was easy. I was inspired to join the Daring Bakers by Peabody's choice from July 2007, the Strawberry Mirror Cake by the California Culinary Academy, so this is the challenge I have chosen to make. My mirror finished on top of the cake, was smooth and didn't tear, my Bavarian cream filled in all the spaces it was supposed to, and everything set. The only variations from the recipe for me were that I didn't dye the mirror or the Bavarian cream with food colouring, and I (accidentally) did not strain the strawberry puree for the Bavarian cream. I don't think it mattered a jot. This cake was smooth and light, not overly sweet or creamy, and is a perfect summer breeze through a miserable winter's afternoon. I think this cake should be served at a garden party with ladies in dainty tea dresses and dapper gents, with long tall glasses of Pimms and lemonade on the side. To see what challenges the other Daring Bakers selected this month, visit the slide show at the Daring Kitchen. This will be my last Daring Bakers challenge for now. 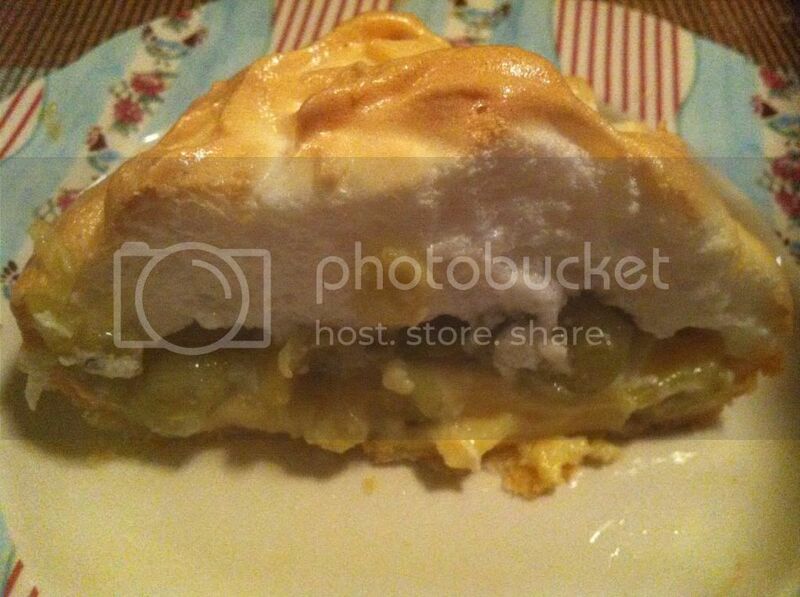 I have been a member since January 2008, when I made lemon meringue pie, and have completed 66 challenges, so I think I have proved my daring. I now want to free up some space in my life for other things. I think that making the cake that inspired me to join the group is a fitting way to bow out. It's hard to pick a favourite challenge, but I particularly enjoyed making the Caramel Cake, the decorated sugar cookies, the Povitica, the Battenberg cake and the recent Princesstarta. Best wishes to the continuing Daring Bakers - be daring! Welcome to another French Friday with Dorie. This week's recipe is Dieter's Tartine. This dish is comprised of toasted sourdough topped with cottage cheese (I left out the sour cream), cucumber , tomato, salt and pepper and chives. It tasted really good - better than I had thought it would. I would never have tried this on my own. 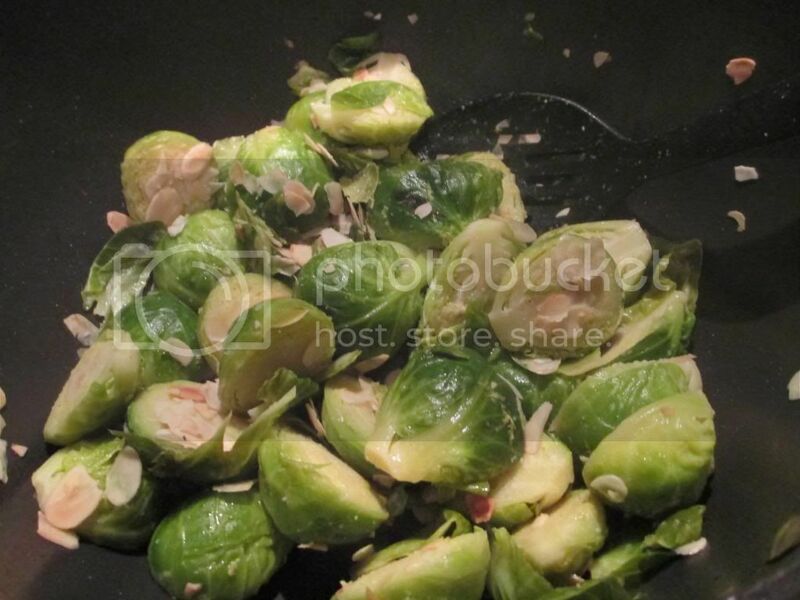 This week's Wednesday with Donna Hay recipe was selected by Chaya, and is Brussels Sprouts with Lemon, Garlic and Almonds. I really enjoyed this dish, the recipe for which is online here. The almonds gave a lovely crunch to the sautéed Brussels sprouts. This one is definitely a keeper. To see what Chaya, Kayte, Margaret and our newest member, Sarah, thought of this dish, visit their websites. Prince William and the Duchess of Cambridge's baby was born yesterday, 22 July 2013, at around 4.24 pm. It was a baby boy, and it is a very exciting event for Britain and the Commonwealth. 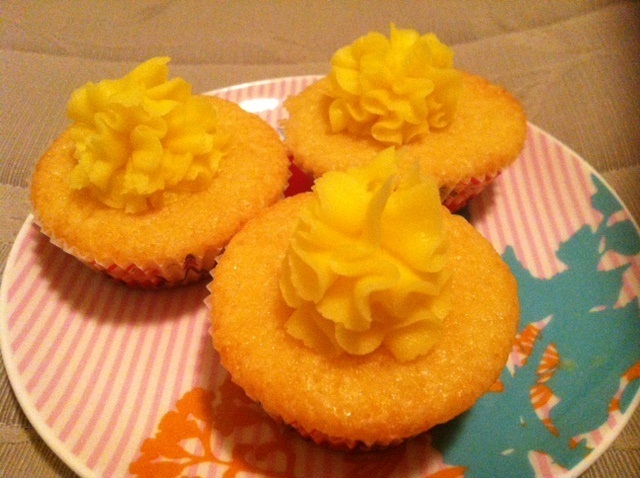 Unfortunately, I was tucked up in bed when the baby arrived, but the night before, when I knew that Kate was in labour, I made some celebratory lemon baby cakes for the occasion. I made them yellow, being a gender-neutral colour, as I could not guess whether the Royal bub would be a boy or a girl. The recipe that I used was for mini lemon meringue cupcakes from The Primrose Bakery Book (suitably from a London bakery), sans the meringue. Instead, I topped the cupcakes with vanilla buttercream tinted yellow. I only made a third of the recipe, as I didn't want to have to ice 36 cupcakes in the middle of the night. 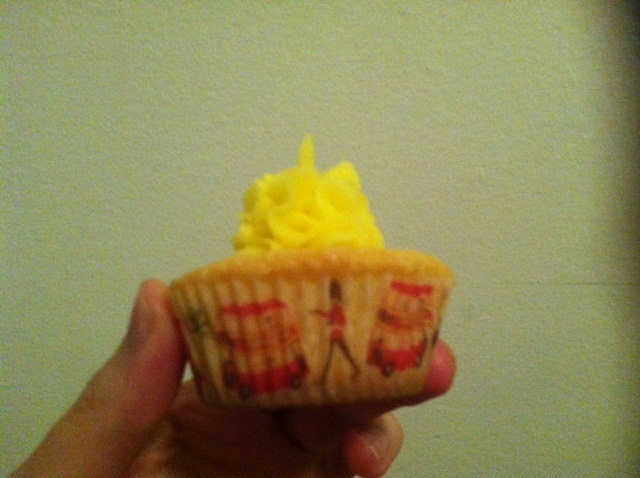 These cupcakes are light and spongy, and rather more on the sweeter side than I would normally like. Next time, I would up the lemon factor by rubbing lemon zest into the sugar rather than just using a minimal amount of lemon juice, as the flavour was not very lemony. Preheat your oven to 180 degrees Celsius. Beat the butter and the sugar together in a stand mixer until light amd creamy, then beat in the eggs. In a small jug, mix together the milk, lemon juice and sour cream. 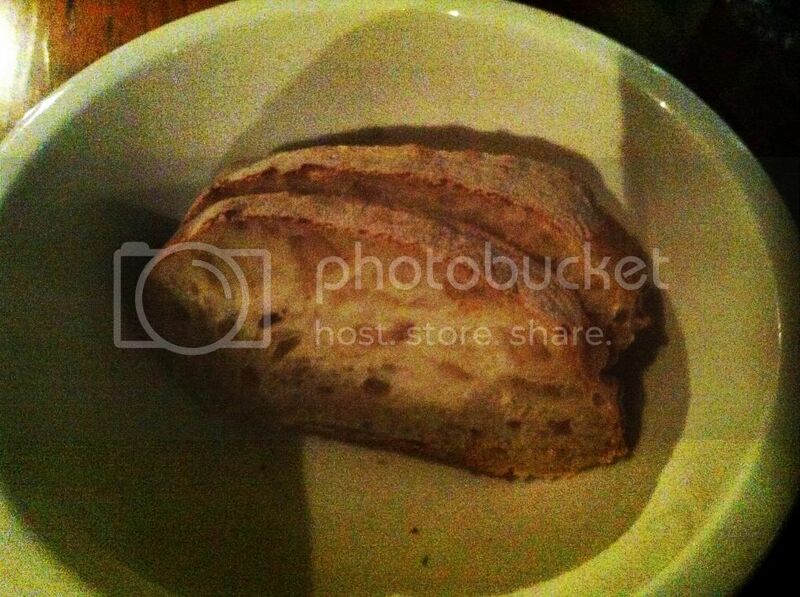 Sift the flours together in a separate bowl. Alternately add to the sugar/butter/egg mixture one third of the flours and one half of the milk mixture, combining well between each addition, and repeat until all of the flour and all of the milk has been added to the mixture, beginning and ending with the flours. Spoon the batter into mini muffin tins lined with papers, ensuring that you do not fill the papers more than 2/3 full, and bake in the prepeheated oven for 15 minutes or until the cakes are cooked through and golden. Immediately unmould the cakes from the tins (otherwise the papers will sweat off), and allow the cakes to cool on a wire rack. Once cooled, ice the cakes and decorate as desired. I used this buttercream recipe and piped it in ruffles on top of the cakes. Congratulations to the Duke and Duchess of Cambridge on the birth of their son! I have an eye for unusual cakes, and so when I saw Karen Martini's recipe for Spiced Coffee, Date and Pomegranate Loaf, it went straight to the "must make" list. This cake has strong flavours from coffee, orange zest (or in my case, mandarin zest), dates, walnurs (I used almonds), cardamom, cloves, cinnamon and pomegranate molasses. I was pleased to finally be able to use my pomegranate molasses! This cake has big flavour, and is very moist, almost fudgy inside. Kids would not generally like this cake. 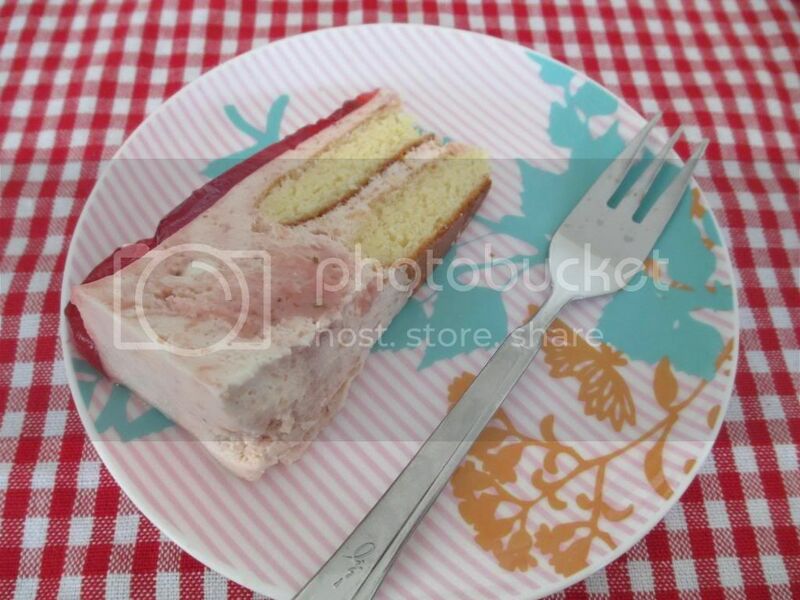 In the end, although I found the flavour and texture of this cake to be unusual, I enjoyed it. The only thing that I would change is the pomegranate molasses on top of the cake. I didn't like the sweet and sour taste in that context, and next time I would leave it off. If you are looking for a cake that is a little different, you can't go past this one. It's Friday again - I am glad to have made it. Highlights of this week were enjoying a Mad Mex beef burrito and a Corona with Tim before seeing a free screening of Before Midnight courtesy of Mimco, going to an excellent talk on Social Media and the Law at one of the law firms, and enjoying a single caramel dome chocolate from Ganache Chocolate as a lunchtime treat. Friday also means French Fridays with Dorie, and this week, our recipe is Mediterranean Swordfish with (or in my case, without) Frilly Herb Salad. 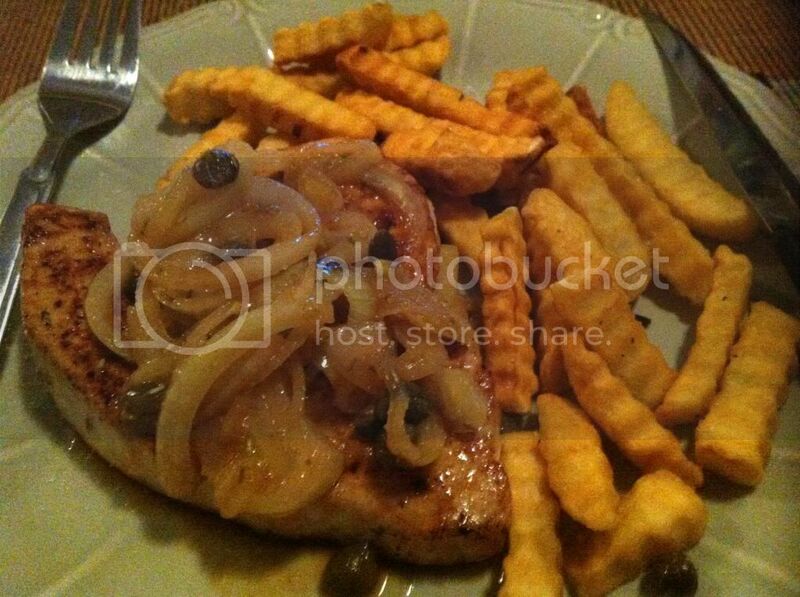 I have never had swordfish before, and can't even remember seeing it at the supermarket. Accordingly, after a visit to the dentist, I walked up to swanky Hawksburn Village to see if I could buy some there - I figure that the cashed up end of town would be more likely to have swordfish than anywhere else. Sure enough, I found my swordfish - at $5.10 per 100g. Ouch! Needless to say, I only bought one swordfish steak for the princely sum of $10.20. In the end, although this was a pricey dine at home option, I found the marinated swordfish, cooked until just opaque, to be absolutely delicious. It sure beats the rubbery flake option that I sometimes indulge in at home. The fish had a delicate flavour complemented by the lightly spiced marinade, and it melted in your mouth. Fabulous! There was no way I was going to spend about $9 on herbs to make a salad that I didn't really want in the middle of winter, so I went the more traditional route of fish and chips. The chips were so so because they have been living in my freezer for quite a long time, but they plumped out the meal. If they had been fresher, I think that this upmarket fish and chips would have been totally grouse. To see what the other Doristas thought of this week's pick, visit the LYL section of the website. Who knew you could make dumplings? Dumplings are those mysterious but wonderful flavour-filled packages that you buy at Chinese restaurants. I never dreamed that you could make your own quite easily at home. This week for Wednesday with Donna Hay, I learned that you could. Margaret chose Dumplings from Off the Shelf, to use up our wonton wrappers from last month. These little parcels comprise wonton wrappers filled with pork mince (in my case, Otways pork mince bought in Hawksburn Village), sweet chilli sauce, hoisin sauce and coriander, then steamed or poached in stock. I didn't have any hoisin sauce, so I used citrus honey sauce instead, and I poached my dumplings in beef stock. I served the dumplings with sweet chilli sauce on the side. I was amazed - not only did the finished product look the part, but it tasted great too. Yum!!! 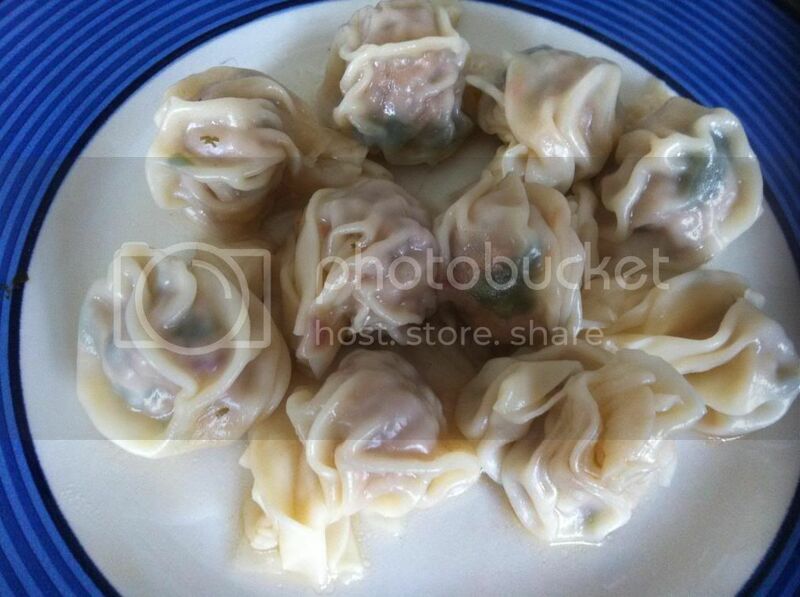 To see what Margaret, Kayte and Chaya thought of these dumplings, visit their websites. This week's Baking with Julia recipe is Summer Vegetable Tart. 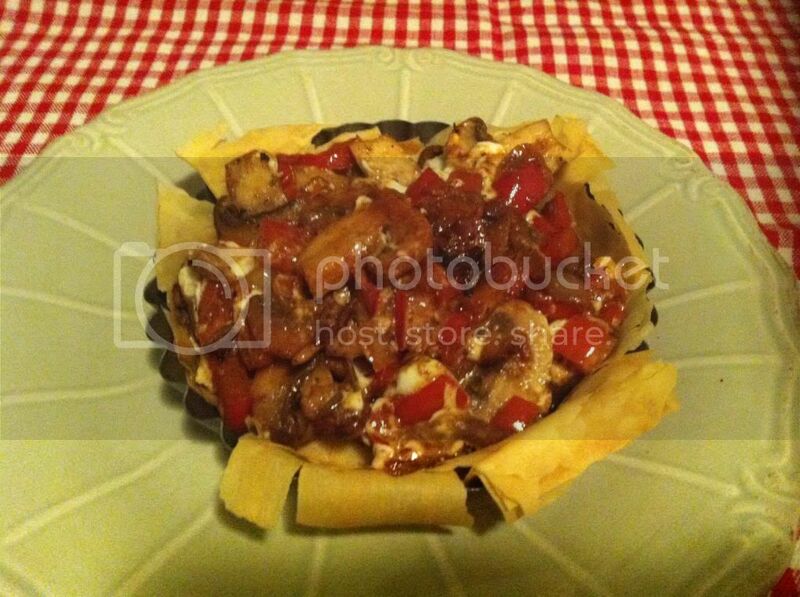 It comprises a phyllo pastry shell filled with mushrooms, garlic, capsicum, onion and goats cheese. 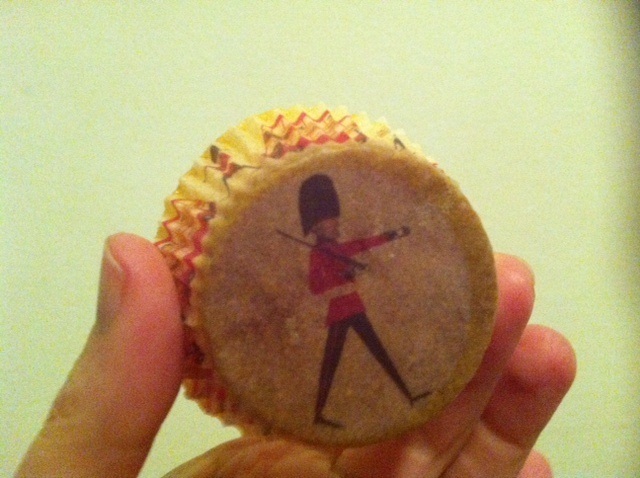 I made one mini tart just for me. I thought this tart was fine taste-wise, although I had a fight with my very old phyllo while making it (hence the dishevelled appearance of my tart). 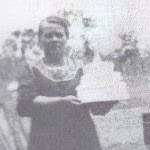 To see what the other BWJ bakers thought, visit the LYL section of the website. This will be my last Baking with Julia for now, as I want to clear some space to concentrate on other things for a while. At the end of June, Tim and I went on a road trip for a weekend in Echuca-Moama. Echuca is on the Victorian side of the border, and Moama is its sister town on the New South Wales side of the border. Both towns are on the banks of the Murray River, and Echuca was once a thriving cargo port for paddle steamers. This led to a mini series called All the Rivers Run, based on the novel by Nancy Cato, being filmed in Echuca in the early 1980s. The dark blue bars represent the Murray River and each of the rivers that run into it: the Murrumbidgee, the Lachlan and the Darling. The stars each represent the five states of Australia, and the Union Jack is for the mother country, England. We also took an educational Wharf Walk tour through the historical parts of Echuca. You can find out more details about the walk here. In the evening, we went back to the Port of Echuca for dinner at Oscar W's (after Oscar Wilde). Oscar W's overlooks the Murray River, and we were lucky enough to score a window table. This was fabulous, as the local feta was spreadable, smooth and creamy, and the dukkah crunchy and nutty. This dish had just the right amount of kick, with the spicy chicken contrasting with the sweetness of the dates and pumpkin. All of the diverse flavours subtly blended in with each other, so no one flavour overwhelmed the dish. I would definitely eat this again! The mash was smooth and creamy, while the beans were crispy and texturally crunchy. As you can see, it is a deconstructed cheesecake, and it was quite wonderful. I especially loved the frosted walnuts. If you ever get the chance to visit Echuca-Moama, I highly recommend dropping in to Oscar W's, with beautiful views, friendly service and fabulous food. You can't lose! Today is Bastille Day or French National Day, and what better way to celebrate than by making a French dish. In my case, I have chosen a perennial favourite, Quiche Lorraine. It also ties in with Tour de France, so I have used the recipe for Quiche Lorraine from Gabriel Gate's Taste le Tour cookbook. Gabriel does a food show every year on SBS during the Tour de France which showcases dishes from the regions through which the Tour is being conducted. This Quiche Lorraine recipe, by Philippe Mouchel, is also available online here. My modifications were to use 200ml skim milk and 200ml light cream instead of 100:300 full cream milk and heavy cream, and to use 50g smoked cheddar and 50g mature cheddar. I also did not use extra butter to fry the bacon. In the pastry, I used a whole egg instead of just the yolk, as I didn't want yet another egg white hanging around (my freezer is full of them). 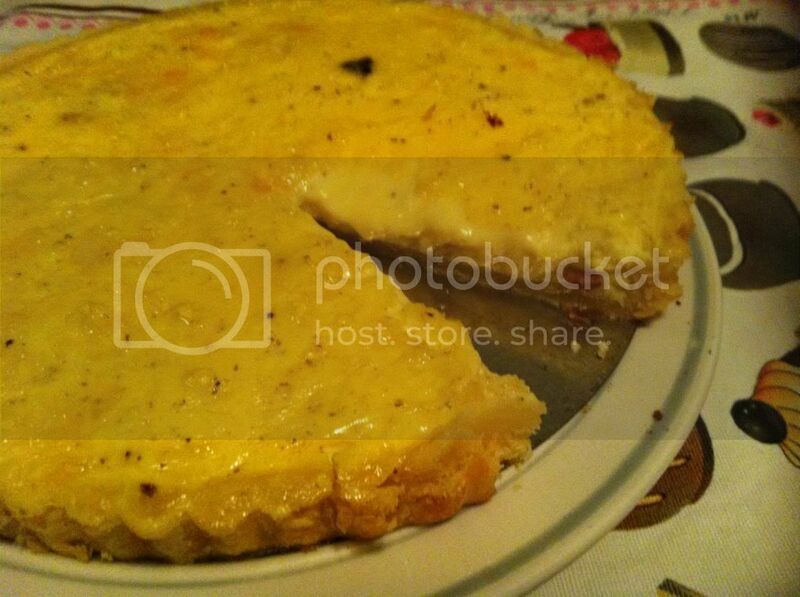 This quiche out beautifully cheesy and creamy, although I believe that more bacon would have been better. It is a really nice, easy dish, and I would make it again. We have reached the end of another working week, which coincides with French Friday with Dorie. 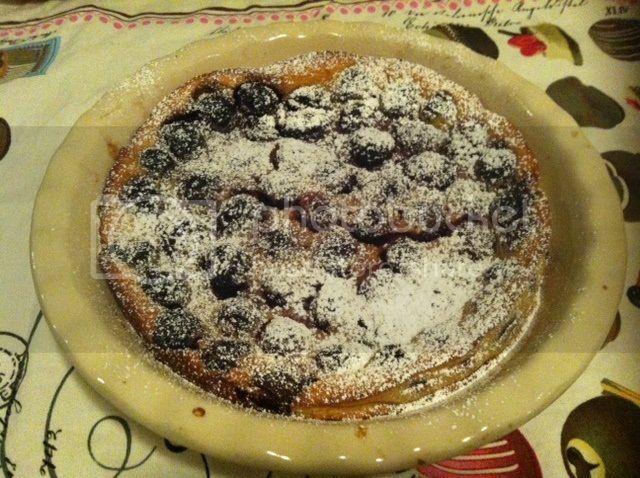 This week's recipe is Whole Cherry Clafoutis. Why? Because unusually, the recipe contains cherries, pits and all. I ended up using a combination of pitted and unpitted frozen cherries because I didn't have enough of either to use just one type. It was custardy inside, like it should be, so I think that's all that matters. To see what the other FFwD cooks thought of this recipe, visit the LYL section of the website. This week's Wednesday with Donna Hay pick comes from Kayte, who has chosen Pine Nut Brown Butter with Green Beans. 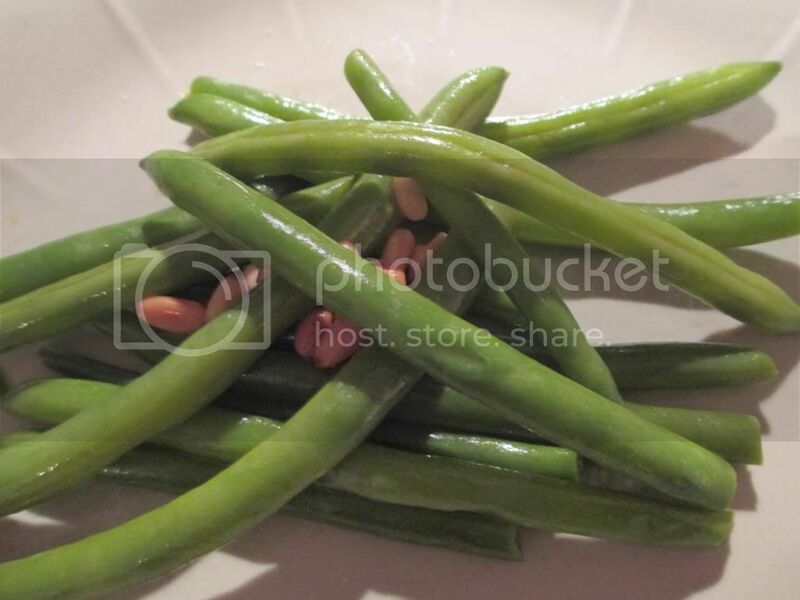 As the title of the recipe suggests, this recipe is comprised of browned butter, mixed with pine nuts (I toasted mine for extra flavour), and poured over green beans (I boiled mine rather than steaming them). I like beans, so this was never going to disappoint; however, I like Beans A La Sunday, with cream instead of butter, better. To see what Kayte, Margaret and Chaya thought, visit their sites. I am a fan of the Roaring Twenties, and I was very excited when Baz's movie of The Great Gatsby was finally released. I had to wait a while to see it, but see it I did last weekend - and I loved it. Baz's movie has been criticised because it lacks the subtlety of the book. I on the other hand think that Baz's big, brash style is perfect for bringing to life the opulence and excesses of the era. Besides, if the movie tried to be as subtle as the book, people who had not read the book would not understand great chunks of it. The Great Gatsby was a set text for me in grade 10 at school under the late, great Mr Penny. I re-read it before seeing the movie, but many of my friends and acquaintances had never read the book, so Baz's movie is a perfect vehicle for introducing the story to them. It was only the tiny details that irritated me a little - for instance, in the book, Jordan had hair the colour of a gold autumn leaf and Daisy was dark haired, but the movie reverses and changes this. Myrtle as played by the lovely Isla Fisher was not middle-aged and voluptuous. Gatsby was not shot while lying on an air mattress. However, apart from the details about Myrtle (which I think are important to understanding her motivations), these are but minor details that do not detract from the story. I loved the movie, and I'd see it again. In keeping with the theme of the Roaring Twenties, which is "so hot right now", Kiki Bee has released a fun cookbook called Bootleg Bakery: Wickedly Boozy Treats Inspired By the Roaring Twenties. I can't resist a somewhat tongue-in-cheek but fun cookbook, so I bought it, and was not disappointed. There is all manner of fun, boozy recipes in the book, including the Shimmy Sherry Shakewell (a boozy take on the Bakewell Tart), Fluttering Green Fairy Cakes (who can forget Kylie's absinthe fairy? ), and for Mad Men fans, the Old Fashioned, Refashioned. However, the cake that caught my eye first up was the Pimms O'Cake (p12), as I am a fan of Pimms and Lemonade. For the uninitiated, the makers of Pimms have a series of advertisements whereby time for Pimms is "Pimms O'Clock". (My favourite is this one which screened when I was living in London.) Accordingly, the name of this cake is a play on the Pimms O'Clock slogan. I made the cake into 6 standard sized cupcakes (see photo at the top of this post), and frosted them with Pimms flavoured buttercream (unpictured), which departs from the unfrosted cake in the book. (My reason for this was not that I love frosting, but more that I wanted to test a piping technique.) Instead of drowning the cakes in Pimms syrup, as the recipe called for, I added Pimms to the mixture. Preheat your oven to 180 degrees Celsius. Grease a 450g loaf pan. In a stand mixer, beat together the butter and sugar until light and creamy. Beat in the eggs, a little at a time. Sift the flour over the batter and fold it in carefully with a rubber spatula, then fold in the orange and lemon zests and chopped mint. Add 50ml of Pimms to the mixture, pour the mixture into the prepared loaf tin, and bake for 40-50 minutes. While the cake is baking, make a Pimms syrup by combining the remaining Pimms and orange and lemon juices in a jug. When the cake is baked, remove it from the oven and leave it to cool in the tin for 5 minutes, then unmould it onto a wire rack, and turn it right side up. While the cake is still hot, prick the top of the cake all over with a skewer and pour the Pimms syrup over the cake slowly, giving the liquid time to soak in. If you want an authentic Wimbledon and punting on the Thames feel, when the cake is cool, decorate it with sliced strawberries and mint leaves. I am fascinated by unusual fruits and vegetables. What is commonplace for some is hard to get here, and when something pops up in the markets or at the shops that I have never seen before, I often grab it without putting to much thought into what I am going to do with it. A couple of Christmases ago, gooseberries popped up at the fruit shop. Christmas is a busy baking time for me, so rather than try and deal with the gooseberries immediately, I popped them into the freezer. There they stayed until now, and as you can imagine, they became a little the worse for wear. Last weekend, I had to make pastry for Baking with Julia. I ended up with some pastry left over, and I thought it would be perfect to make a small tart case for my gooseberry tart. I was on my way! 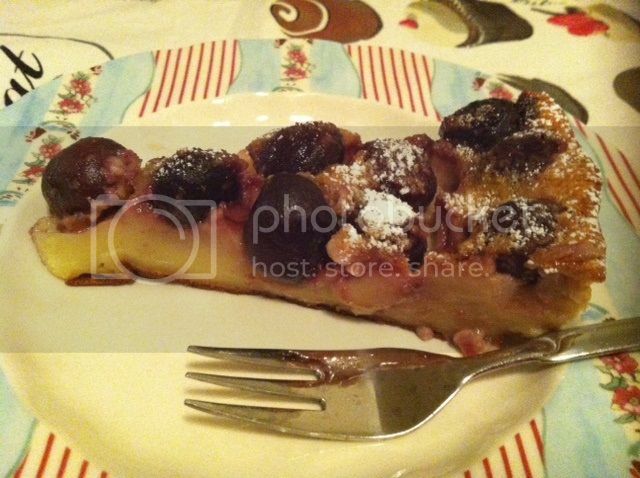 This tart was absolutely scrumptious - light to eat, with sweet balanced by sour. It was dessert heaven. I had to cut down the recipe in proportion to the number of gooseberries I had, but in the end, I think it turned out alright. For the pastry, I used the offcuts from the yoghurt tart - recipe for a full batch is here. You only need enough pastry to line a 4" inch tart pan. Blind bake the tart shell. Whisk the egg yolk with a teaspoon of sugar to a ribbon consistency, then whisk in the flour. Heat the milk with the rest of the sugar in saucepan and the vanilla essence, and as soon as it boils, pour it onto the egg yolk mixture, stirring constantly. Once combined, pour the mixture back into the saucepan, bring to the boil, and allow it to cook for a couple of minutes until thickened. Spread over the base of the tart shell. 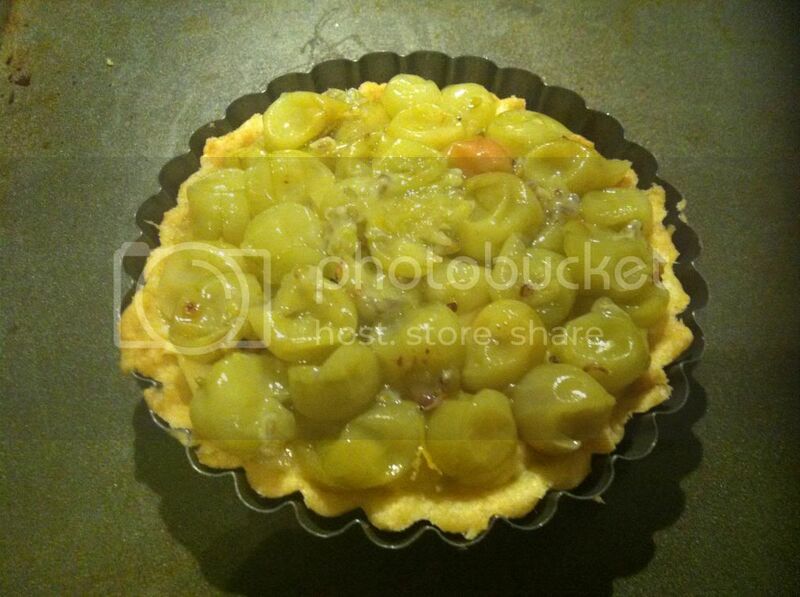 I then poached approximately 125g of gooseberries in 2 cups of water and one cup sugar in a small saucepan for around 10 minutes, drained off the syrup and layered the poached gooseberries on top of the crème patisserie. Finally, I made a meringue topping by beating one egg white with 25g of sugar to stiff peak stage, and piled it in snowy peaks over the top of my tart. 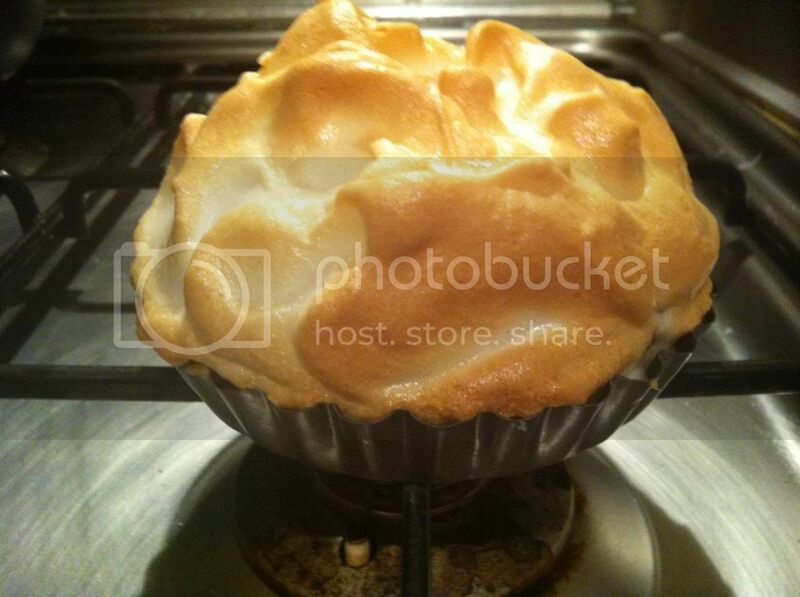 I then baked the tart at 190 degrees Celsius for 10-15 minutes until the meringue was golden. I then removed the tart from the oven and allowed it to cool to room temperature before eating it. Nom! We've made it to Friday again. This week, the weather has gone from mild to cold, dry to wet, still to windy. Brrrr. 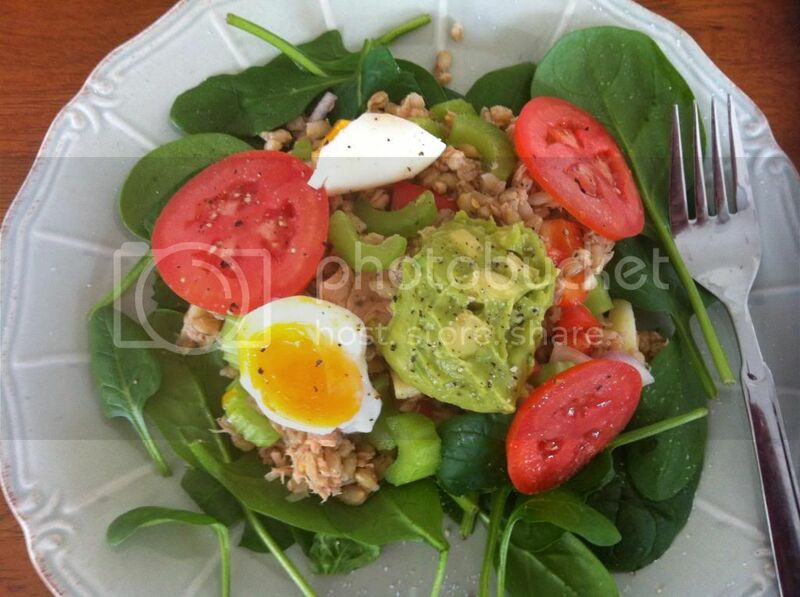 It's not really salad weather here, but this week's French Fridays with Dorie recipe was Wheat Berry and Tuna Salad. Luckily, the grains are heated, so I could serve it as a kind of warm salad. Wheat berries are not sold here, so far as I can tell. The closest I could find was farro, and I didn't bother to buy it when I knew I still had a bag of pearled barley from another Dorie experiment to use up. I used whole tomatoes instead of cherry tomatoes, and I used ready mashed avocado because I could only find hard, horrid little avocadoes sold as a three-pack in the supermarket. I enjoyed this more than I thought I would. I made half a recipe so I got two servings out of it. It is not as nice the second day, as some of the sharper flavours in the mix, especially the raw onion, start to take over. However, it is still OK. I am not sure that I would make it again, but for a healthy meal, it is tasty. 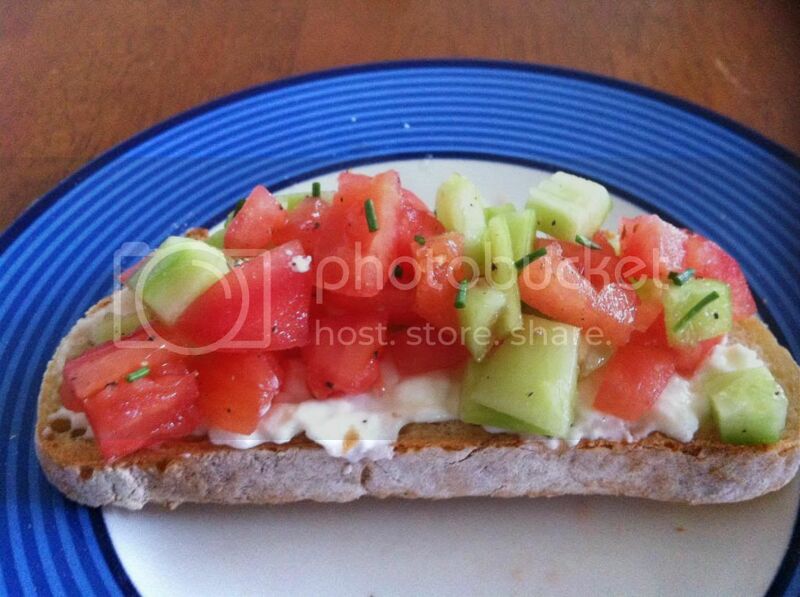 To see what the other Dorie cooks thought of this dish, visit the LYL section of the website. To all US readers, Happy 4th of July! 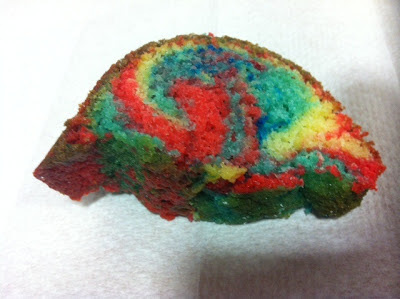 This post is a celebration of red white and blue in the form of a Marble Bundt Cake in those three colours. 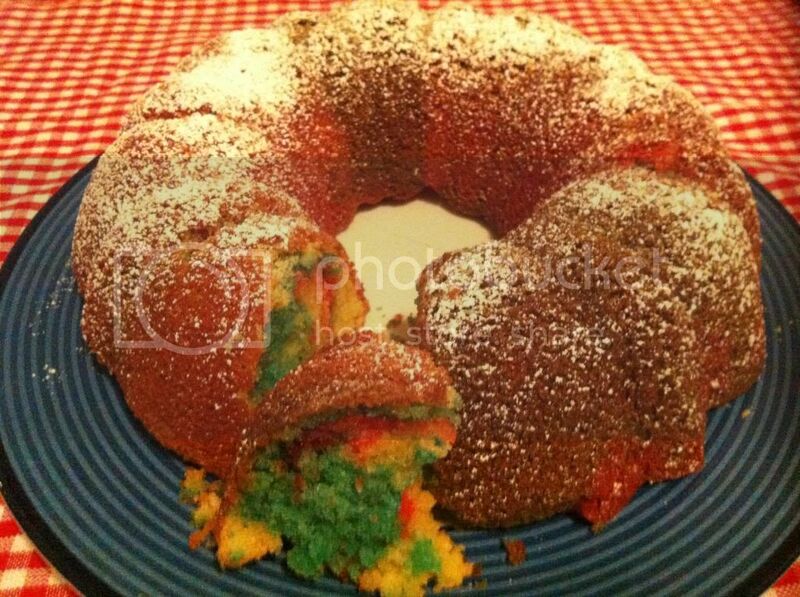 It is a really simple cake to make in that it is all made in one bowl - just dump and mix. Unless of course you use three colours like me, then you need three bowls, one for each colour. Spray a 9 1/2" Bundt pan with cooking oil spray and preheat your oven to 350 degrees Celsius. Put all of the ingredients except the milk into a stand mixer and beat until just combined. Stir in the milk. Divide the batter evenly between three bowls, and colour one bowl of batter red and one bowl of batter blue. Place spoonfuls of each colour of batter in an alternating pattern into the oiled Bundt tin, and bake for 35-40 minutes or until cooked through. Leave the cake in the tin for 5-10 minutes to cool. Unmould the cake onto a wire rack to cool completely. Dust the cake with icing sugar.